Wow so http://how-old.net/ guesses your age based on a photo today at Microsoft BUILD. It was was built to demo the capabilities of Azure, Microsoft's Cloud Computing Platform & Services. All you need to do is upload a photo and the tool will analyze your face to guess your age. Every photo I've uploaded has been SPOT-ON. Seriously… it's been wickedly accurate. I don't know what voodoo they're using but it's wicked cool. To be sure it wasn't just picking up pictures of me from around the web and doing some magic around that I uploaded shot up some pics of my gal and of my kid; all pics I know aren't on the interwebs and it nailed them with precision too. I’ve been a heavy Windows user my entire life. Sure, I’ve played with Linux but since as a profession I develop with Microsoft technologies I’ve always been tethered to the Windows world. I’ve been fortunate that something that was a hobby turned into something I could get paid to do. However, having your hobby as a job takes the hobby out of it! The last week or so has been filled with information from Microsoft. One of the cooler things to happen came out during the keynote presentation at TechEd Middle East in Dubai. The softie Eric Rudder played the same Indiana Jones style game on a Windows computer, a Windows Phone 7 phone, AND an Xbox 360. Gaming is about to get to blow up and MS is making it’s power play. Not only is the game itself playable on all three platforms, but the session is maintained when you move from each device: if you’re playing on your Xbox and have to run out the door, you’ll be on the same level when you fire it up on your Windows Phone 7 Series phone. Basically, you’ll never have an excuse not to be gaming. This all seems utterly wicked from a technology perspective and simultaneously devastating from a “get anything done/have a social life” angle. I can’t imagine a game like… Civilizations… where you have that “just one more turn” mentality!!! 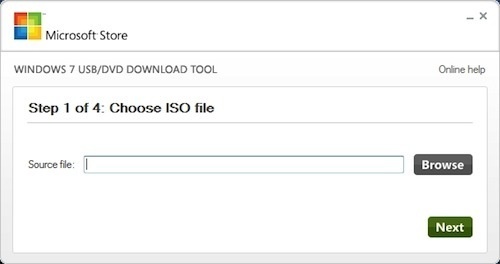 If you’re trying to install Windows 7 on a netbook (or are having issues with your PC’s optical drive), the free USB Download Tool from Microsoft allows you to take a .ISO image and turn it into a bootable flash drive. This was created not only for netbook users, but for anyone that opted to download Windows 7 from Microsoft in lieu of ordering an installation DVD. Windows 7 USB Download Tool can create a bootable flash drive (or DVD, if you prefer) from the downloaded .ISO file in quick fashion—just install it and follow the on-screen prompts. Note that if you opt to use a flash drive, it must be 4GB or larger to hold all the files. The coolest part: Microsoft has open sourced this little app. Why, you ask? They got a bit of flak early on in the project for re-using open-source code and improperly documenting it (as well as making the program itself closed source), but true to their word that it was only a mistake, it’s been brought back and declared open source for all to use. So if you still haven’t gotten Windows 7 installed on that netbook of yours, head on over to CodePlex, Microsoft’s open-source repository, and download the tool now.